Tails' Workshop in Sonic Chronicles. Tails' workshop has appeared in several Sonic games; a modest little abode where Miles Prower can tinker with his inventions and store the Tornado. 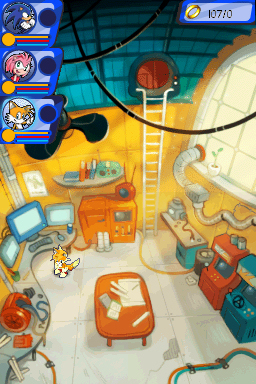 Part home, part laboratory, Tails either has several of these workshops or he moves house regularly, as the building never seems to be in the same place from game to game. Tails Adventures, as "Tails' House", where it serves as the fox's base on the south shore of Cocoa Island. Comes complete with a submarine lab for servicing the Sea Fox. Sonic the Fighters, as both hanger and launchpad for the Lunar Fox. Sonic Adventure, where the workshop is in Mystic Ruins, and houses the Tornado. Sonic Battle, where Tails' Laboratory is seperate from Tails' House, both in Emerald Town. The lab contains a battle arena and VR training facility, as well as computers which prove useless in analysing Emerl. Sonic Chronicles: The Dark Brotherhood, functioning as the party's base for the first 4 chapters. In the north of Central City, again it serves as a hangar for the Tornado biplane.